There are 2 common types sold, salted and unsalted. Many years back, before it was commercially sold everywhere, my student gave me a pack of salted coral seaweed and I had no idea how to consume it and it was left around until it watered... So so sorry. This time, I knew how to prepare it and I'm so glad the Chinese herbal shop where I bought it sold the unsalted version. 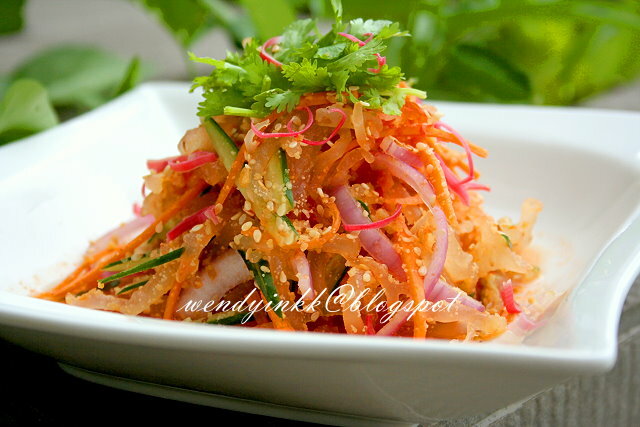 Sold at RM6 for 200gm, it's an affordable form of collagen that is easy to prepare. Restaurants in Tawau serve these seaweed in the form of kerabu. Totally appetizing and can be done ahead of time with final composition done just before serving. I drank all the dressing when we have finished eating the kerabu, LOL. 1. Drain seaweed well, snip them shorter. Pickle with calamansi juice, sugar and salt. 3. When it's almost time to serve, mix with the other ingredients and garnish with coriander. hi , wendy . thanks for sharing the recipe . It looks tempting ! BTW , may i know what is coral seaweed and calamansi juice ? thanks. I love sourish food, so this is right up my alley:D err...except chicken feet! Wendy, where can I buy this seaweed? This looks very appetizing. Seen this coral seaweed but wonder how to prepare this. Thanks for sharing this refreshing idea! Thanks Wendy...I have a packet of this for two years in my fridge. Didnt know what to do with it. WIll try out your recipe. what a great recipe... 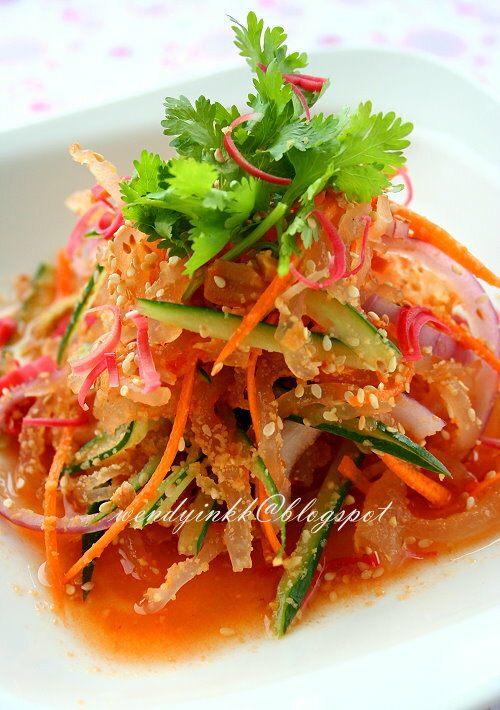 I like the coral seaweed, usually only make it as dessert.. now i can make it into a salad! love the colors of the salad,, impressive for entertainment too. 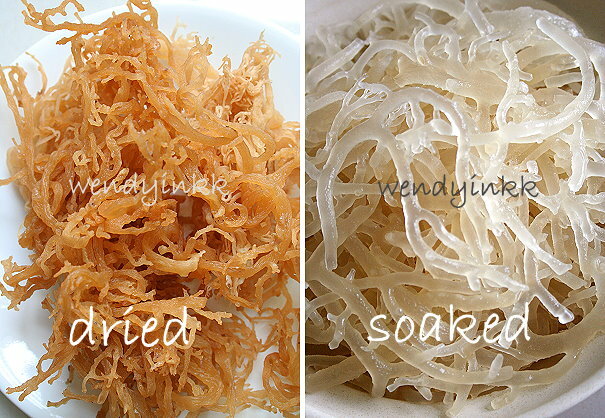 wendy, is this the same with the seaweed that are so popular right now for their collagen ingredient? ?